I’ve mentioned cemetery-themed terraria on the site previously, but I love this extra-miniature example by Etsy seller LBrandt. It uses moss for the greenery and is housed in a hanging glass drop. 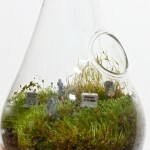 The shop also sells miniature headstones and even a teeny little grim reaper for your terrarium-decorating pleasure. I’m not sure how much the seller charges (the shop is temporarily closed), but it would be reasonably easy to do a DIY version inexpensively. Moss is easy to maintain (there are instructions for creating a moss terrarium here, here, and about a zillion other places on the Web), and it’s great for very small containers. You could also try air plants (like those used in this terrarium-in-a-light-bulb tutorial) or miniature ferns. In addition to the glass drop used here, you could also try laboratory flasks, canning jars, or even the big glass “decorate it yourself” ornaments sold at craft stores. If you want a slightly larger container, brandy snifters, goldfish bowls, and lidded glass kitchen canisters are all possibilities. Miniature headstones are available from some dollhouse suppliers, although if you’re doing a particular teeny design it might be easier to make them yourself out of Sculpy or polymer clay. Add a few rocks (dabbing them with diluted yogurt will encourage the moss to grow all over them) or other appropriately somber-looking decorations, and you’ve got a little pocket of gloom perfect for your desk or windowsill. I think a little twisty-looking bonsai tree on mossy ground would look especially nice surrounded by tombstones.